The weather is one aspect of life we can do nothing about. Those of us who live in areas where snow is a certainty in the winter months know only too well how much disruption it can cause. Even a light snow fall can leave things in chaos if we are unprepared for it. The worst part is having to get up early to clear the driveway and paths, and you really don’t want to have to do that on a cold and wet morning! 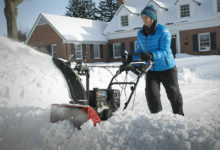 This is one good reason why the snowblower is fast becoming a must-have item. These machines have been used commercially for a long time, but are also available for domestic and residential use. What are they, and how do they work? That’s what we’re here to tell you! Snow Blower, Snow Thrower or Snow Shovel? There is some confusion as to whether you should be talking about the best snow blower, or a snow thrower. In fact, the two refer to the same machine – but with minor differences! Put simply, there are three different types of snow blower: single stage, 2-stage and 3-stage. The former is the one that ‘throws’ the snow out of the way, while the latter two actually do blow it. Let’s talk about the basic machine first. 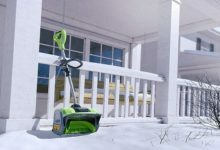 A single-stage electric snow shovel will be powered by an electric motor – you will find models with cords and those that also have rechargeable batteries, known as cordless snow shovels – which drives an auger. The auger is simply a set of blades that rotate when the motor is switched on. In the single stage model, the auger lifts the snow and throws it – the direction may vary but is usually to the side – about 10 to 20ft clear. It is that simple. This type of machine will easily clear light to medium snow falls. The length of the auger is something you need to look at, and bear in mind that while lighter, smaller machines will have plastic blades, more heavy-duty models may have metal blades. The length of the auger determines the width of the path it will clear, while the diameter determines the depth. The specifications of the machine will tell you these figures in more detail, but all you need to know for now is that the wider and deeper the clearance, the bigger the machine will be. A single stage model may be sufficient if you only experience light to medium snowfall, but should you live in an area where the winters are harsher, you really should be looking at a two or three-stage machine. What’s the difference? Let’s try and explain in simple terms. A 2-stage machine will use an auger like any other, but instead of the auger being used to throw the snow, it is simply used to clear it. This means you get greater efficiency from your auger, and you can also use wider auger as a result. The snow is collected into a chute as usual, and the machine includes what is known as an ‘impeller’. This blows the snow out of the chute. 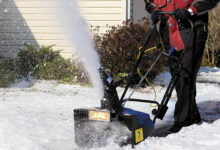 What are the benefits of this type of snow blower? First, you get a wider and often deeper clearance, with more snow moved more quickly. Second, the snow can be blown a greater distance, so you have a clearer path. Also, because of the extra weight of the larger machine, this type of snow blower – unlike the smaller models – will be self-propelled; the motor will drive a set of wheels so it is easier to move around. 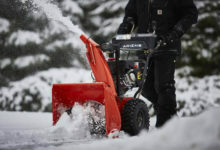 These machines are more expensive than single-stage models, and you will find that the bigger ones are gas-powered rather than electric, but for heavier snow they are needed to do the job. The three-stage snow blower is the most effective of the lot. These machines use two augers which drive the snow inwards, to the middle of the machine. They can extend to very wide cutting paths. The snow is then picked up by a device known as an induction accelerator. This breaks the snow down and forces it into the impeller, which does the job of delivering the snow elsewhere – sometimes to an impressive distance, perhaps as much as 50ft. The beauty of the three-stage machine is that it is the only one that will completely clear a path; both of the others may leave a thin layer of snow thanks to the auger not actually touching the ground. Thus, if you have very heavy snow – or require complete clearing – you need the 3-stage model to get the job done. This is the biggest and heaviest machine of the three types, but will be self-propelled and may even have power steering, so prepare to pay more if you need one of these. The first thing we will say is that a snow blower, even for those in areas where only light or medium snow is expected, will make your life a lot easier. 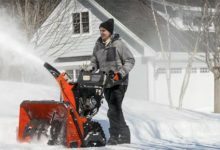 Rather than getting your shovel out and manually clearing away the snow, you simply plug in or switch on your snow blower, and do the job much, much faster than you ever could before. 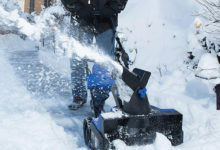 The single-stage snow blower – the one that throws the snow – is perfect for a normal, light to medium snowfall area, and will pack away compactly in your garage or shed during the months it is not used. 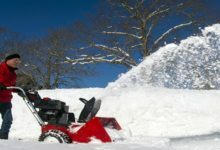 If you have heavier snowfall – or a large area that you need to clear on a regular basis – you need to look at either the two or three-stage machines. These will clear your snow much more quickly than the single stage models, and can shift quite considerable amounts of snow in a surprisingly short time. 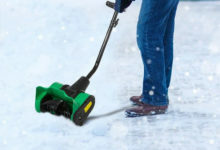 There is a lot to be said for buying one of these essentially simple yet very effective machines, so we recommend you check out the different snow blowers available and see how you can make those cold and wet winter mornings more bearable.